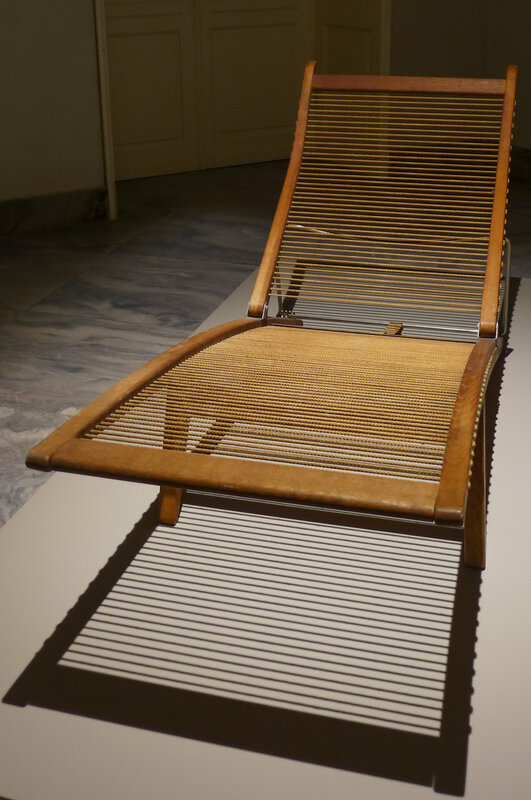 Hans Wegner designed this elegant and simple recliner or deck chair in wood in 1958. There are two main sections … a long frame for the seat is gently curved in a convex arc that rests on the ground at the back but is raised off the ground by short tapered legs towards the front. Inset from the back is a frame for the back rest that is fixed to the seat frame with metal pivots on each side and held in one of four possible angles by a bar of metal hinged to the back rest and held at the bottom on sprogs on the seat frame … a mechanism similar to that on the Tub Chair also by Wegner and designed in 1954. 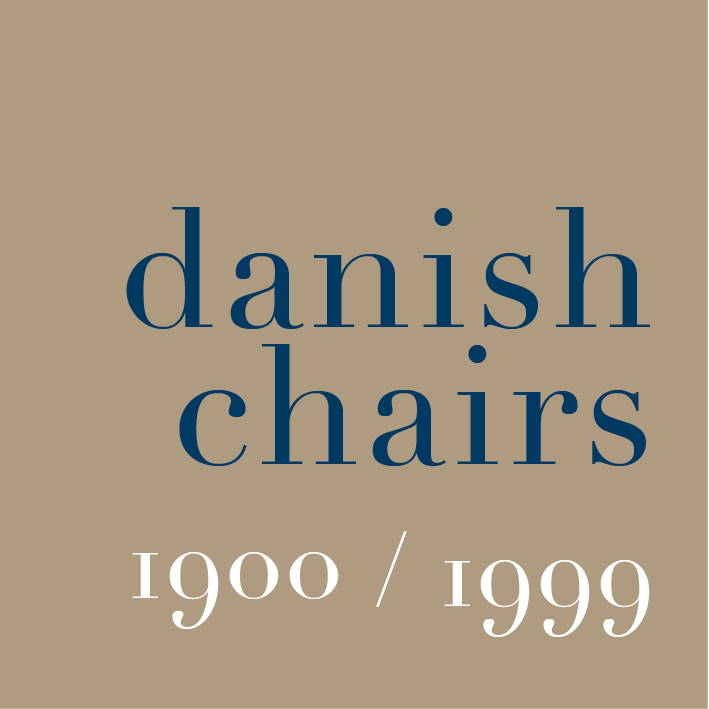 This appears to be a basic arrangement when compared with the beautiful and well-made brass hinges on the deck chair by Kaare Klint. There are no arm rests on the recliner by Wegner. There are wide, cross bars or stretchers set flat across the frames at strategic points so between the legs, at the very front edge of the seat frame, towards the foot at the back end of the seat and across the back rest just below the top. The side frames of the back rest continue above the cross bar and are shaped and reminiscent of the handles of a wheel barrow … presumably a feature to help manoeuvre the chair into the right position in the sun. There is no cross bar or stretcher at the bottom of the back rest - as this would stick into the lower back of someone using the chair - so the frame of the back rest is held rigid by the pivots or hinges at the bottom where the back rest is joined to the frame of the seat. Rope or halyard is taken backwards and forwards across the seat and back rest and is threaded through regularly-spaced holes along the sides of the two frames. Halyard or rope was used in a surprising number of chairs in the 1950s and 1960s, and not just for garden or terrace furniture. It was most-often used in its natural colour so a grey/brown or buff of the jute used to make the rope although some designs were and are offered with the rope dyed black. Modern versions of these chairs use halyard with the jute wrapped around a nylon core for a stronger rope and to minimise stretching. The way the rope is strung across a seat or seat and back varies so either threaded through holes - as here on the recliner by Wegner - or, more often, tightly spaced and wrapped over the frame - as with paper cord - or the rope can be knotted at intervals along the frame and formed into a net rather like a hammock with the ropes interwoven in a diamond pattern or possibly with cleats or metal loops that act as spacers. Through his career Hans Wegner used rope or halyard on some of his largest and most dramatic chairs including the Flag Halyard Chair in 1950, the Hammock Chair pp135 from 1967, Rocking Chair pp124 from 1984 and Circle Chair from 1986. Poul Kjærholm used rope for the seat and back of Chair PK25 designed in 1951, for the wooden chair made by Thorvald Madsens Snedkerier that was designed by Kjærholm in 1952 and for the small and light dining chair PK3 designed in 1956.